I like it spicy but if you like it a little bit less hot, you may want to use less chili flakes and/or Sriracha sauce. Heat oil in a pan and fry onions, garlic, ginger and chili flakes. Sauté for a few minutes and until soft. Add fish sauce and let sauté for another minute. Meanwhile, mix the soy sauce, sushi vinegar, cornstarch, and tamarind paste in a small bowl. Add this to the onions mixture and cook on medium-high heat until it starts to bubble. Add 100 ml water, the Sriracha sauce and combine thoroughly. Use a hand blender to make the sauce smoother (optional) and put the sauce in a small baking dish. 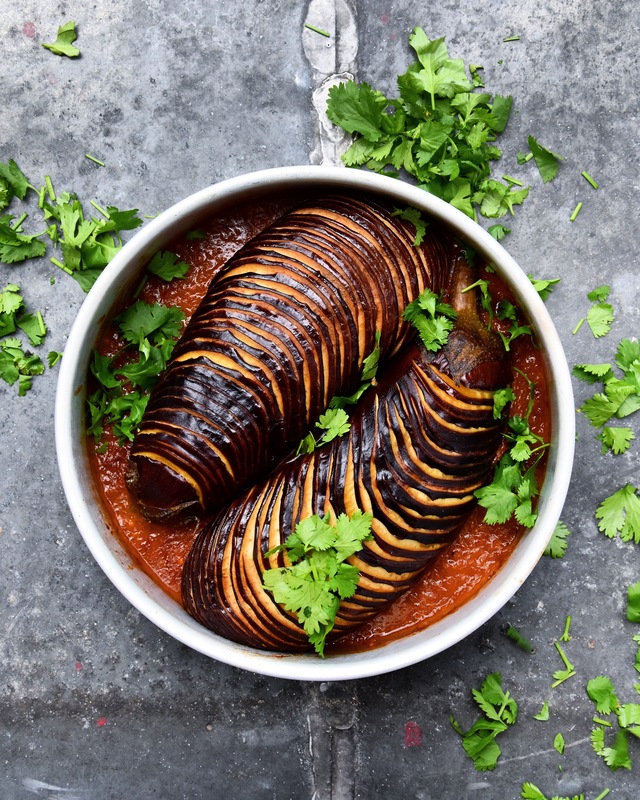 Cut the eggplants hasselback and add to the sauce. Bake for approximately 30 minutes, until soft. Garnish with chopped coriander leaves and serve with steamed or fried rice or noodles. This also goes great with a fresh salad, like a watermelon + cucumber + feta + coriander + red onion + olive oil salad.